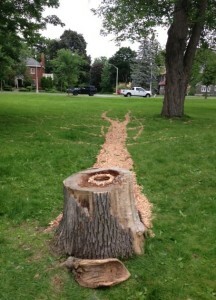 Students at the Davis Art School have created a one of a kind art piece in Hampton Park on Island Park Drive about the destruction of the Emerald Ash Borer beetle. The beetle invades ash trees and untimately leads to their death. Ottawa has a very large infestation of these pests and has lost a significant amount of tree canopy in the city. 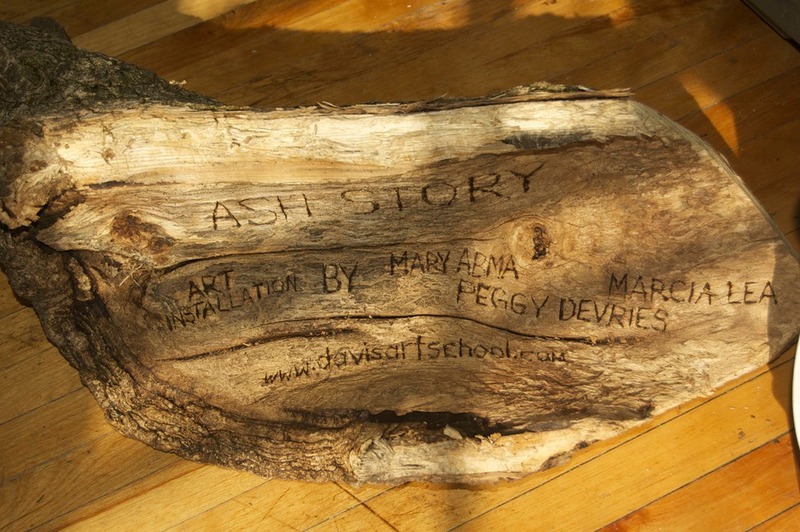 The artists Mary Abma, Peggy DeVries and Marcia Lea have used an old stump of one such ash tree and created a beautiful living art piece in the community.They have stratigically placed woodchips close by to re-create the tree’s “shadow” in the park. The “S’ shaped marking where the beetles leave the leave after draining it of its nurtrients are painted in green paint for emphasis. Another line of woodchips is painted red to symbolize veins.The woodchips used for the artwork are from other ash trees that have been cut down due to infestation.The installation is able to be viewed in Hampton Park until June 20,2015, with a potential for extension by the NCC. A quick correction: your headline refers to the David Art School, but it should be the Davis Art School.